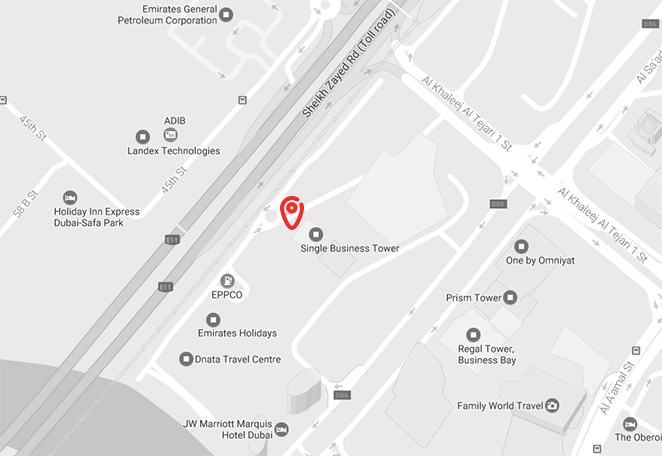 On the 31st floor of the Single Business Tower, a landmark at the center of Business Bay on Sheikh Zayed Road, Dubai’s largest street extending all the way to the border of Abu Dhabi and linking all of the city’s important crossroads – that is where EAST END has found its international location. Amidst the architectural sensations downtown such as the Burj Khalifa, the Emirates Towers or the world’s largest shopping center, possibilities seem sheer endless. The continually growing environment of superlatives in Business Bay inspires creative and visionary concepts. The innovative spirit of the legendary and constantly expanding skyline inspires the conception, planning and realization of one-of-a-kind brand experiences for customers worldwide. The unique location on the lifestyle project Water Canal with a promenade, racetrack and a 12km long bicycle path offers not only short distances to extraordinary event locations, but also to impressive landmarks, the yacht harbor and Dubai Mall. Stop by and discover for yourself the exceptional opportunities for brand staging amidst exciting locations while enjoying the view over the pulsing metropolis.